As the lights dimmed on the 8th World Water Forum on Friday 23 March 2018, the international community is urged to continue to pay the utmost attention to today’s climate-induced humanitarian crises that are affecting much of our world more frequently and more severely. 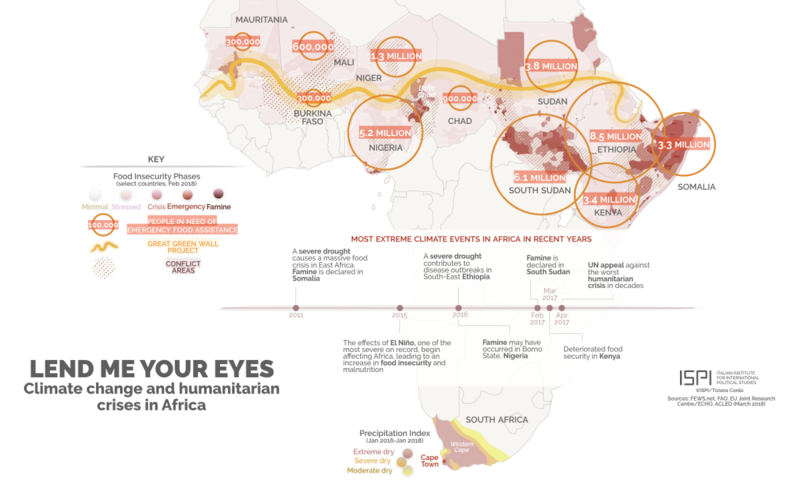 Although often neglected by the international community and the media alike, climate-related events such as droughts and famines are still a source of hardship and death for millions of people today, especially in Africa. This ISPI Dossier tries to shed light on several ongoing or looming humanitarian crises in sub-Saharan Africa — from the shores of Lake Chad to the gentle hills of Cape Town, through South Sudan, the Horn of Africa and Kenya, including the alarming case of green grabbing-induced displacements — investigating the connections among its diverse causes, in part definitely anthropogenic, but where climatic conditions often play a deleterious multiplier effect on existing vulnerabilities.